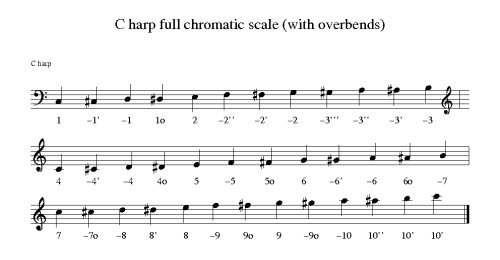 abc2harp is a Perl script that adds harmonica (harp) tab to ABC music notation in the form of lyrics text. Currently only the 10-hole diatonic harp is supported. The key of the harp can be specified (default is the same key as the music i.e. “straight harp”). Overbends can be allowed or disallowed (default). "X-ABC2HARP HarpKey" commands in input file. (default=no). Overrides all "X-ABC2HARP OverBends"
How do I insert ABC2HARP commands?Use “%%X-ABC2HARP <command>” to directly insert ABC2HARP commands at the appropriate sections in the file (note: must be on a separate line). Please refer to the included examples.abc for examples.Currently available commands are “HarpKey <harpkey>” and “OverBends <yes|no>”. Only 10-hole diatonics are supported currently – Inline key changes are not supported, but clef changes should be okay – This is NOT a parser! I’m just using mostly string substitution to get the results I want. I’m too lazy to write a full abc parser.